Two people were killed after a woman driving a stolen car crashed into their vehicle at the intersection of Santa Fe Drive and Mineral Avenue in Littleton in the early hours of Feb. 6, according to the Douglas County Sheriff's Office. Bixby, in an older mugshot from Denver County. Douglas County Sheriff defended his department's policy on giving chase to fleeing suspects at a Feb. 7 press conference. Deanna Bixby, 20, was driving a stolen Mitsubishi that collided with an unrelated vehicle following a police chase focused on a different stolen vehicle, said Douglas County Sheriff Tony Spurlock in a press conference Feb. 7. 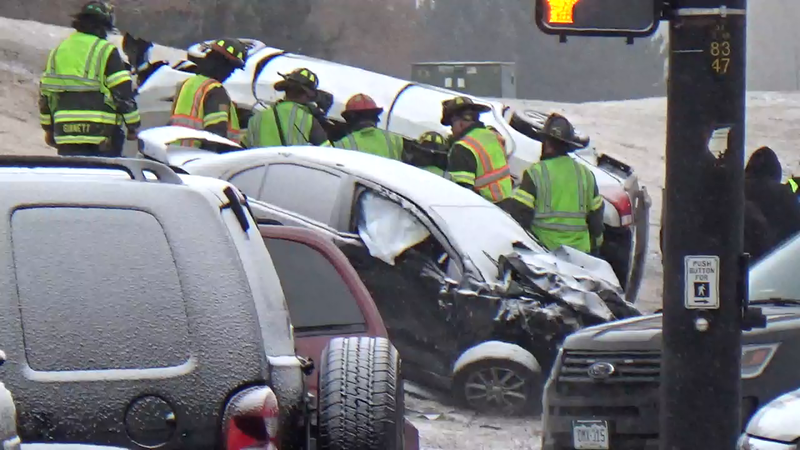 Jayne Davicsin, 25, and Ryan Carter, 27, were killed in the crash, according to a press release from the Arapahoe County Coroner's Office. “This is a tragedy,” Spurlock said. Spurlock defended his department’s policy on chasing fleeing suspects, which allows deputies to chase vehicles they believe are stolen, as well as cars driving erratically, suspects believed to present a serious threat and people suspected of felonies against individuals. Douglas County is investigating the suspects and will conduct an administrative review of deputies' actions during the chase, Spurlock said, while Littleton Police will investigate the crash itself. The crash followed a police chase that began 15 miles to the south in Castle Pines, Spurlock said. A deputy spotted two suspicious vehicles — a Jeep and a Mitsubishi — on Lagae Road in Castle Pines shortly before 2 a.m. on Feb 6, Spurlock said, and the vehicles sped off as the deputy approached. The Mitsubishi and the Jeep turned northbound on Highway 85, which is known as Santa Fe Drive farther north, and the deputy gave chase to the Jeep. The Mitsubishi disappeared from the deputy’s view, and the Jeep began driving erratically and brake-checking the deputy, Spurlock said. Deputies deployed “stop sticks” in four locations along northbound Highway 85 as the cars continued north, but the Jeep avoided them by driving north in the southbound lanes. A Douglas County deputy positioned at Highway 85 and Highlands Ranch Parkway saw the Mitsubishi drive past, going north in the southbound lanes and pursued it, Spurlock said. The Mitsubishi hit speeds of 100 mph, Spurlock said, before colliding with an SUV headed westbound on Mineral Avenue. The chase for the Jeep was terminated after the Mitsubishi crashed, Spurlock said. The Jeep was found a short time later at a nearby shopping center, with one tire blown out. The driver of the Jeep remains at large and investigators don’t have a description, Spurlock said. Littleton Police were never notified as the chase approached Littleton, said Littleton Police spokesman Commander Trent Cooper. "It's typically customary if we're engaged in a chase and we're leaving our jurisdiction, we'll notify the jurisdiction we're entering," Cooper said of Littleton Police. "It's hard to judge. I'm sure Douglas County's dispatchers had a lot going on. I can tell you our chase policy is very strict, because pursuits are very dangerous. Very few things are worth this kind of risk." Douglas County dispatchers did notify Littleton once the Jeep entered Littleton, but the chase ended at almost the same time because of the crash, said Cocha Heyden, a spokesperson for the Douglas County Sheriff's Office. Littleton wasn't notified sooner because deputies were focused on the Jeep and had lost track of the Mitsubishi amidst the chaotic chase, Heyden said. "Essentially we didn't have time to call much out since (the Mitsubishi) sped so far ahead of us and we were just trying to catch up," Heyden said. Deputies found a handgun in the Mitsubishi, Spurlock said. Bixby was seriously injured in the crash and is in custody at an area hospital. Bixby has not yet been charged in the incident, though she is being held on several outstanding warrants from Jefferson and Denver counties, mostly related to failures to appear in court on a variety of drug-related offenses. Bixby’s older sister Jane Bixby made headlines in Littleton in June 2017 when she hit a Littleton police officer with a stolen car in a parking lot. Both Bixby sisters were later apprehended, along with several other people, as part of a smash-and-grab robbery of a cell phone store in August 2017. Both sisters pleaded guilty to charges related to the robbery. Spurlock said the blame for the crash is on the drivers of the stolen cars. “All of this could have been avoided if the individuals had not done those crimes,” Spurlock said. Anyone who witnessed the pursuit or crash is asked to call the Douglas County Sheriff's Office at 303-660-7579.